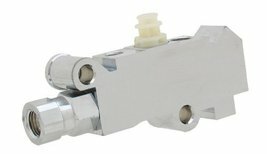 AC DELCO style proportioning-combination valve in Chrome. carry individual proportioning valves for ycustomized application. Works on , and MOPAR. These combination-proportioning valves are based on the popular AC DELCO 172-1353(disc-drum) and 172-1361(disc-disc) valves. When upgrading your vehicle from drum to disc, these small items are a must. These components ensure proper fluid transfer and contain a residual pressure valve for proper braking feel.